This week we’ve been highlighting ways your church pews can help your church become a wedding destination and a beautiful setting for weddings. We’ve also gathered a bunch of decoration ideas on our Pinterest board of great ideas for pew decorations. But the style of your church pews can have a big impact on how people use your church for weddings.More traditionally styled church pews, like the ones show above, are going to attract a couple who wants to get married in a traditional setting with a quiet ceremony full of reverence for their vows. Couples who want a traditional wedding prefer tasteful, tried and true traditions that have been passed down from generation to generation. Brides who want traditional styled weddings often want to incorporate family heirlooms, like wearing an updated version of their mother’s gown or using the same flowers in their bouquet. To appeal to these types of couples, you’ll want to think about traditional church layouts with straight lines and a dark wood stain for your pew ends. Symmetry is also important to the traditional couple so give some thought to the position of your aisle, pulpit, and alter. 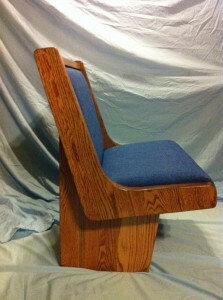 Modern styled pews, like this example show on the right, don’t lend themselves as well to pew end decorations because the simplicity leaves less room. Couples who want a minimalist wedding with just a few well-thought out decorations will find a strong appeal in pews in this more modern style. Modern couples also usually want to have special touches that set their wedding apart from others. One modern wedding might decide to have a jazz band play a fun version of the wedding march, while a traditional couple who might opt for an organ tune. Couples who find modern weddings more appealing very well may see the church as a canvas to be filled in with special memories and unique decorations. These couples often want to start their own traditions. 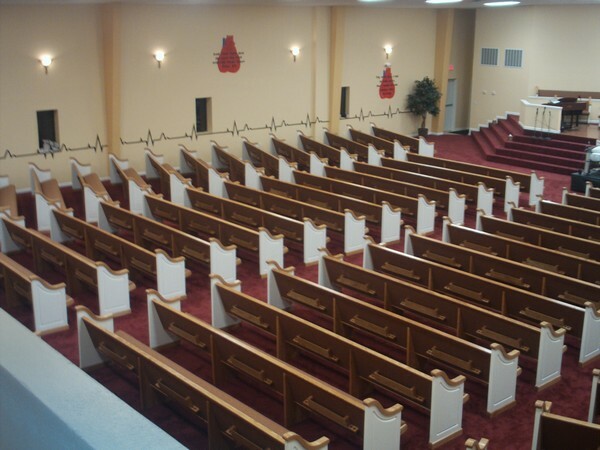 Between modern and traditional styles of church pews, you can also add a lot of appeal to your church by how and where your pulpits, lecterns, and communion tables are positioned. If you want to be able to allow couples to move these items, make sure you think about that in the design of your church sanctuary to allow for these pieces of church furniture to be moved and repositioned. Most pulpits aren’t very easily moved, however, or are not meant to be moved, so it makes sense to consider both regular church services and special events in your church when you decide where to place the pulpit. If you’re unsure of what kind of church pew style or pulpit is best for your church, we can help you decide what fits your community best. Don’t hesitate to give us a call.